Chamberlain's Leathermilk Healing Balm and included applicator. 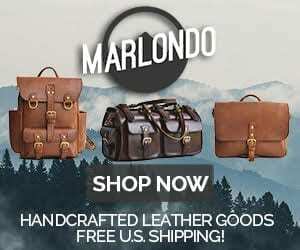 While a lot of our viewers love scratching up their products as part of establishing a personalized patina on leather goods, I recognize that others would rather minimize the scratches. Depending on the finish of leather, scratches may enhance or destruct the aesthetics. Sometimes, a bag or other leather product is in need of a surface makeover, which is where Chamberlain’s Leathermilk Healing Balm can assist. Healing Balm and included applicator pictured alongside a Saddleback Leather Overnight Bag, a company they have a great relationship with. The healing balm comes in a small tin along with a sponge-like applicator. Don’t be fooled by the size of the tin: a little goes a long way. The smell of the balm is pleasant, reminiscent of coconut macaroons. The product has a beeswax-like texture, and is made from various oils and waxes. Application of the product to leather goods is very simple with the applicator, and like I stated before, a small amount goes a long way. Chamberlain’s Leathermilk Healing Balm and included applicator. For the purpose of testing the balm, I wanted to try a few different leather colors and textures. Used for the tests are one vegetable tanned Classic Bifold wallet by Corter Leather, one chrome tanned Gun Deck wallet by Das Offene Meer Leather Company, one Saddleback Leather Overnight Bag, and one Saddleback Leather Large Satchel. I chose these as they all have differing levels of patina and texture, and was not directed by any of the companies to use their product for demonstration. I intentionally created some scratches and scuffs on products to show a before and after. Note that I did follow Chamberlain’s instructions to let the balm absorb, than later buff out any leftover balm that did not absorb. They have a nice guide on using the healing balm here. Creasing and scratches near the handle support of a Saddleback Leather Large Satchel. After applying the balm, the edge is definitely taken of the small scratches and the crease is filled in color. Intentional scratch made on a Gun Deck Wallet. The scratch can still be seen slightly in the middle, but much more mild in tone. Had some fun with this one – scratched BL for BestLeather out with my finger on a Corter Leather Classic Bifold. The “BL” scratch can barely be made out, certainly displaying an improvement. Scratch on the strap of a Saddleback Leather Large Weekender Bag in Tobacco. Similar to other treatments, the scratch toned down considerably. 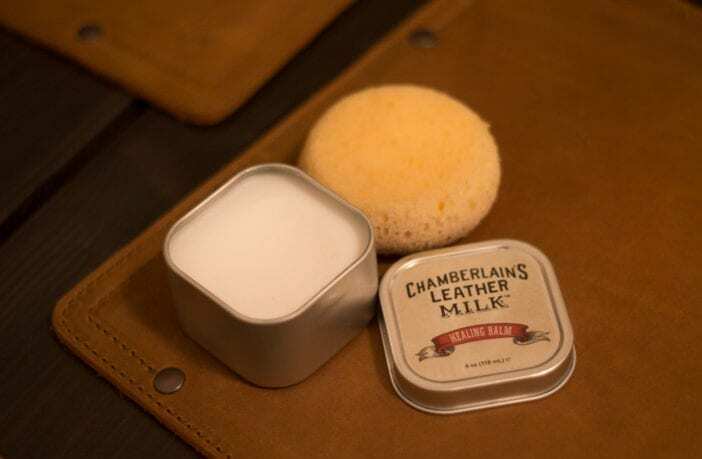 Overall, the Chamberlain’s Leathermilk Healing Balm is great for toning down scratches and scuffs in varying textures of leather. It does an excellent job of muting the harshness of surface level scratches. If you are not a fan of the scent, rest assured it does fade quickly especially after a quick buff of the leather. I would use this most often for things such as wallets, which can become scuffed up if you throw your keys or pocketknife/flashlight into the same pocket incidentally. I have a feeling it would also be great for automobile leather, but my light colored leather seats were too tan to test any discernible areas. Priced at nearly $17.00 with free shipping, its well worth it and the small tin will last quite some time even treating multiple bags and small goods. I’d like to reiterate that this product is mainly for spot treatment, I don’t see it being ideal to cover an entire bag, but in some cases that may be the best idea, particularly with darker or black bags. Deep gouges or bug bites in full grain leather would likely not be treatable. Scuff on an outer heel of a Wolverine 1000 Mile Boot in cordovan color. The scratch remains, but less attention-drawing. Everyday carry enthusiast slowly transforming into a leather, canvas, and denim aficionado. Lover of horology, cycling, photography, and research.